Published: Oct. 14, 2018 at 07:08 p.m. 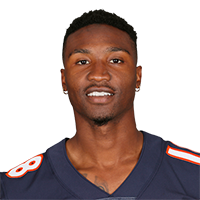 Published: Sept. 30, 2018 at 08:33 p.m.
Chicago Bears quarterback Mitchell Trubisky is joined by Chase Daniel behind the center, and Trubisky shovels a short pass to Taylor Gabriel for a 3-yard touchdown. Published: Sept. 30, 2018 at 03:18 p.m.
Chicago Bears wide receiver Taylor Gabriel takes advantage of a perfectly run play to get open by the pylon for a 3-yard touchdown.